For those who treat their pets like another member of the family, pet Halloween costumes allow fuzzier family members to join in on the Halloween dress-up fun. Obviously, pet Halloween costumes aren't really for the pets. A dog doesn't care if he's dressed as a popular comic book character. Most people dress their pets in costumes because they think it looks cute. A pet costume can also help round out a group of themed costumes among family or friends. If everyone else is dressed as a ninja, why not have a ninja pet mascot? A few may take their dogs trick-or-treating with them or dress them up before hosting a party, but in many cases, they do it for their own amusement, and take some pictures to share later. If a costume is popular with humans, you can bet there will be a pet version of it. From classic looks like witches and vampires to science-fiction favorites like the characters of Star Wars, you can find Halloween pet costumes to fit any interest. 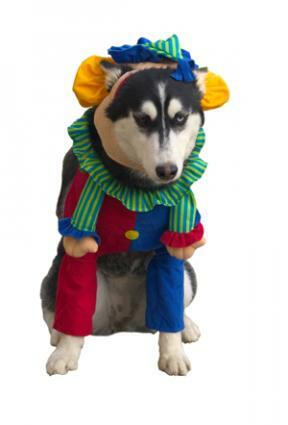 There are a few basic design styles in pet Halloween costumes. Some costumes cover the entire body, like a pair of footy pajamas for animals. For instance, this X-ray dog costume even covers the animal's tail. Other costumes only cover the front half of the animal, turning its front paws into the legs of a human character like Wonder Woman. Another style of costume is more like a cape or bib, tying around the animal's neck, like these devil costumes for cats and dogs. Headbands and Halloween-themed bandanas are also available for a festive touch that doesn't involve wearing an entire costume. You can increase the chances of cooperation by getting your pet used to wearing clothing before the big night. If the intended costume fits over most of your pet's body, a sweater will help it get accustomed to being covered. If your costume is more cape-like, then a bandanna can be a good practice garment. Make sure the costume is comfortable. You don't want to restrict movement or cut off circulation. Avoid covering your pet's face. Just like with humans, a mask or drooping hat obstructing a pet's vision can be dangerous. Cats and dogs can also become frightened when they can't see, and they'll be much more likely to try to remove whatever's on their head. If you pet is uncomfortable or scared, don't push the issue. No photo opportunity is worth traumatizing your pet. While there are costumes readily available for both dogs and cats, you're much more likely to find a dog willing to put up with a costume. If you look at enough online pictures of cats in costumes, the hatred many of these cats feel toward the experience becomes almost palpable. This is not a happy kitty. Even if a cat will endure a costume, it's probably not going to be otherwise cooperative and sit still for a picture or walk around in front of your friends at a party. If you have a smaller pet like a guinea pig, you could potentially make them a costume or dress them in something suitably small like a sweater made for a teddy bear. However, you're likely to get even less cooperation from hamsters than from cats, and the costume is liable to end up thoroughly chewed on. While most pet costumes are designed for Halloween, there are also several options for Christmas. People will most likely choose to dress their pets for family holiday photos and holiday parties. A pair of antlers can turn any dog into Rudolph, and full costumes are available for Santa, angels, and elves.